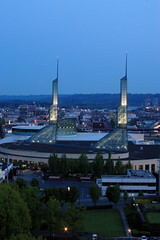 Attend the inaugural culinary FEAST Portland 2012 with 100 chefs and 40 events! Meet Oregon’s Willamette Valley winemakers, chefs and food artisans. Some lucky individuals will win the culinary FEAST of a lifetime on Alaska Airlines for nine nights of indulgence with VIP FEAST passes at www.traveloregon.com/feast. All festival proceeds benefit national and local hunger relief organizations Share Our Strength and Partners for a Hunger-Free Oregon. Follow the festival on Facebook and Twitter (@FeastPDX). 1. FEAST PORTLAND DINNER SERIES September 20, 21 and 22, evenings Locations vary, $95–$200 The Feast Portland Dinner Series affords once-in-a-lifetime opportunities to experience the talents of chefs from across the country without leaving Portland’s city limits. All dinners will feature a collaboration between a Portland chef and a visiting chef and offer local beer, wine, and spirits. Duos include: Sunny Jin (Jory, Newberg, OR) and Nancy Silverton (Osteria Mozza, Los Angeles), Adam Sappington (The Country Cat, PDX) and Elias Cairo (Olympic Provisions, PDX) with Paul Kahan (Chicago); Jenn Louis (Lincoln Restaurant, PDX) with April Bloomfield (Spotted Pig, NYC); Matt Lightner (Atera, NYC) with Sean Brock (Husk, Charleston, SC); and Daniel Patterson (Coi, San Francisco) with Inaki Aizpitarte (Le Chateaubriand, Paris). 2. OREGON BOUNTY MARKETPLACE September 21 and 22, daytime Pioneer Courthouse Square (701 SW Sixth Avenue), $60 per day or $100 for both days Portland’s so-called living room, Pioneer Courthouse Square will transform into the city’s dining room for two days as host to Feast Portland’s grand tasting event—the Oregon Bounty Marketplace, sponsored by Travel Oregon/Oregon Bounty. The 40,000-square-foot, award-wining public space will feature wineries, breweries, cheesemakers, coffee roasters, distillers, and many of the featured regional artisans that landed Oregon’s exciting and energetic food community on the map. Experience the local scene; meet the chefs and the winemakers you’ve read about, watch cooking demonstrations from celebrated local and national chefs, and head to the Oregon Storyteller’s Circle to listen to the stories of the people who paved the way. 3. OREGON BOUNTY MARKETPLACE MAIN CHEF DEMO STAGE September 21 and 22, daytime Pioneer Courthouse Square (701 SW Sixth Avenue), admission included with entry to Marketplace Anchoring the amphitheater steps at Pioneer Courthouse Square, the Oregon Bounty Marketplace main stage will feature cooking demonstrations by some of the most innovative local talent and visiting chefs like Aaron Sanchez, April Bloomfield, Naomi Pomeroy and Seamus Mullen. 4. DIRECTOR PARK TEACHERS FOUNTAIN DEMO STAGE September 21 and 22, daytime Director Park (815 SW Park Avenue), $45 The Teachers Fountain demo stage will feature chefs and experts demonstrating techniques, but without a full kitchen. Learn mortar-and-pestle cooking with Chef Nancy Silverton, taste charcuterie made from locally raised pigs paired with Oregon Pinot Noir grown from the same soil in Pork and Pinot Noir, led by Elias Cairo of Olympic Provisions and Eric Finley of Chop Butchery; enjoy an expert demo, Thai Street Food with Andy Ricker, that will undoubtedly change opinions aboutone of the world’s most misrepresented cuisines; and celebrate chocolate alchemists pushing the boundaries during the Chocolate City, USA, panel led bySebastian Cisneros of Cocanu, David Briggs of Xocolatl de David, and Sarah Hart of Alma Chocolate. 6. DIRECTOR PARK TASTING ANNEX September 21 and 22, daytime Director Park (815 SW Park Avenue), admission included with entry to Teacher’s Fountain The Tasting Annex provides an opportunity for attendees of the Teachers Fountain demos and Lower Terrace Seminars to apply their newfound knowledge in an intimate tasting area. Following each demo and seminar, a tasting experience will be set up to showcase the chocolates, charcuterie, wines, and beers featured in Director Park programming. 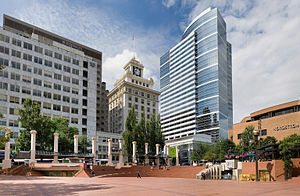 Picture a seminar on Oregon Chardonnay followed by an exclusive tasting of Chardonnays from around the state, or a sampling of Oregon’s bean-to-bar chocolates followed by a confections demo. 7. HANDS-ON CLASSES September 21 and 22, daytime Classes: Le Cordon Bleu (600 SW Tenth Avenue), $65 At the heart of Oregon’s food culture is a devotion to traditional culinary craft. Whether it’s whole-animal butchery, how to pickle and preserve, or how to make the perfect pretzel, Portland and Oregon are home to many expert teachers. Feast Portland has amassed the best of them to share knowledge on how to do it yourself in an intimate classroom setting, including Whole Animal Butchery with Camas Davis, Homemade Bitters by Mark Bitterman, Pretzel Making by Andrea Slonecker, and Root Vegetables by Diane Morgan. 8. FEAST PORTLAND NIGHT MARKET September 21, 6:30 p.m.–9:30 p.m. Ecotrust Building (721 NW Ninth Avenue), $125 With James Beard Award winner Andy Ricker among the planners, the Feast Portland Night Market will transform one of the city’s most well-known historic buildings into the nation’s liveliest outdoor celebration of global street food. Imbued with the spirit of the great nighttime food markets of Southeast Asia, but celebrating multiple food traditions, the Feast Portland Night Market will embody the sights, sounds, smells, and energy of a world culinary journey. The sensory overload is complete with participating chefs like Anita Lo, Aaron Sanchez, and Eddie Huang as well as restaurants Aviary, Boke Bowl, Double Dragon, Biwa, Andina, and Nong’s Khao Man Gai. 9. THE WHOLE FOODS MARKET SPEAKER SERIES September 22, 11 a.m.–3:30 p.m. Gerding Theater at the Armory (128 NW 11th Avenue), $30 The Speaker Series is Feast Portland’s forum for regional and national food-thought leaders to create a platform for open dialogue on issues that are important to our region and to the world. Hosted and curated by Randy Gragg, and featuring experts like Bon Appetit editor in chief Adam Rapoport and food writer Francis Lam, the Speaker Series will provide an opportunity for all attendees to go into greater depth on many different food topics, gain new perspective, and share feedback as part of the food community. Meet the chefs, brewers, artisans and winemakers. Enjoy cooking demonstrations from celebrated chefs like Chris Cosentino, April Bloomfield and Naomi Pomeroy at the KitchenAid Main Demo Stage.